Ash layer from 1790 eruption. The 1790 Footprints refer to a set of footprints found near the Kīlauea volcano in present-day Hawaii Volcanoes National Park on the island of Hawaiʻi. Resulting from an unusually explosive eruption, they are associated with a series of battles in the area in 1790. The 1782 Battle of Mokuʻōhai gave Kamehameha I control of the west and north sides of the island of Hawaiʻi, but Keōua Kuahuʻula and his uncle Keawemauhili were able to escape. For a few years, Kamehameha was occupied with Maui and the arrival of Europeans to Kona, Keōua ruled Kaʻū and Keawemauhili ruled Hilo. Keawemauhili finally recognized Kamehameha as his help. This angered Keōua who raided some of the lands of Kamehameha while he was in Maui at the Battle of Kepaniwai. The footprints were thought to have been left by Keōua's forces in their retreat. While passing Kīlauea, they made offerings to the goddess Pele and made camp. As the volcano started to erupt, they thought they might have made some offense, so he split his group into three and stayed to make more offerings. Two parties of warriors were overwhelmed by a pyroclastic eruption while crossing the desert. Only one party of three survived the eruption. The footprints were attributed by early geologist Thomas Jaggar to those warriors who were killed in this event. Keōua would be killed later in 1791 at Kawaihae. Modern forensic techniques applied in 2008 determined that many of the footprints were made by women and children, not warriors. They were probably already in the area chipping off sharp chunks of glass to use as tools, and left the footprints while escaping during a lull in the eruption. Keōua's groups, however, were at the summit, and some were killed instantly by the following blast of poison gas, not by the actual falling of the ash. Although sometimes called "fossilized", the imprints are not old enough to be true fossils. The fine ash was probably made into thick mud by a rain triggered in the eruption, which then quickly solidified in the tropical sun and was preserved in the arid desert. The footprints were found accidentally by geologist Ruy H. Finch in the hardened ash of the Kaʻū Desert while he was trying to investigate a 1919 eruption that produced Mauna Iki (small mountain). Although the National Park had been formed by then, these lands were owned by the Territory of Hawaii. In 1938 the area was proposed as a bombing practice range, resulting in protest from conservation groups. On June 20, 1938, the Federal Government bought the land to add to the park, with the bombing range limited to four and a half square miles. The Army never used the land, but the Navy caused some injuries to fishermen in 1945. [ citation needed] In June 1950 the bombing range was returned to the park after being cleared of unexploded ordnance. ^ Abraham Fornander (1880). John F. G. Stokes, ed. An Account of the Polynesian Race: Its Origins and Migrations, and the Ancient History of the Hawaiian People to the Times of Kamehameha I. Volume 2. Trübner & Co.
^ a b c "Keonehelelei - The Story of the Footprints Area". Hawai'i Volcanoes National Park. National Park Service. 2008-11-01. Archived from the original on 5 December 2008. Retrieved 2 November 2008. ^ Mary Kawena Pukui and Samuel Hoyt Elbert (2003). "lookup of one". in Hawaiian Dictionary. Ulukau, the Hawaiian Electronic Library, University of Hawaii Press. Retrieved December 12, 2010. ^ Mary Kawena Pukui and Samuel Hoyt Elbert (2003). "lookup of helelei". in Hawaiian Dictionary. Ulukau, the Hawaiian Electronic Library, University of Hawaii Press. Retrieved December 12, 2010. ^ a b c d Jadelyn J. Moniz Nakamura (2003). "Keonehelelei – the falling sands: Hawaii Volcanoes National Park Archaeological Inventory of the Footprints National Register" (PDF). National Park Service. Retrieved December 12, 2010. ^ "Footprints in Kaʻū were probably made in 1790—but not by Keoua's party" on USGS web site, August 28, 2008, Hawaiian Volcano Observatory. 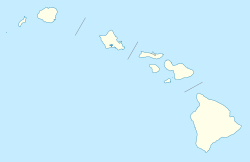 ^ Hawaii County Historic Sites on official State web site. Accessed 2009-05-22. Archived 2009-05-27.